Activity is on-going here but there's not much to show for it at the moment. I'm coming to the end of my City & Guilds Creative Sketchbooks course and my first sketchbook on fans passed assessment thank goodness. I spent Easter putting together a portfolio of all my samples of the different techniques we have learnt over the weeks and now I am working on my second and final sketchbook which has a very scary deadline! The first book was an altered sketchbook but the second one has to be constructed and freestanding which is rather more tricky. I'm planning to use 2 canvases as the ends and make a concertina book between them using mountboard and my theme is windows. On Friday I had a day off work so I walked round town taking pictures of windows and I was amazed at the variety I found. 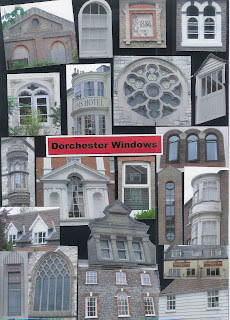 I put some of the photos together in a collage - the most mundane window in there belongs to my house! I took a copy of the collage and cut it into strips and did some paper weaving with it and I'm now thinking of what else I can do with the photos for my sketchbook. Gradually it's starting to come together.